I grew up in Mount Greenwood, and my parents grew up in Pilsen and Little Village. We were the only Mexican family in Mount Greenwood at that time, so much of our life was coming back to these areas where our social networks were and where our community was. I spent every Saturday and Sunday at Harrison Park where my dad played baseball, playing with my He Man and my sister’s barbies underneath the bleachers. During the week, my mom was a runner, and her running club was this old school running club called El Venados, the deers. She would be up here running during the week, so we would be up here then, too. You know, this is a neighborhood that’s always felt like home in a way that no other part of Chicago has—in the way that a Mexican-American person can feel at home in Chicago. When you think about neighborhoods like Pilsen and La Villita that have been predominantly Mexican American for at least a handful of decades, that presence got to be established with persistence —and through so much violence and oppression. 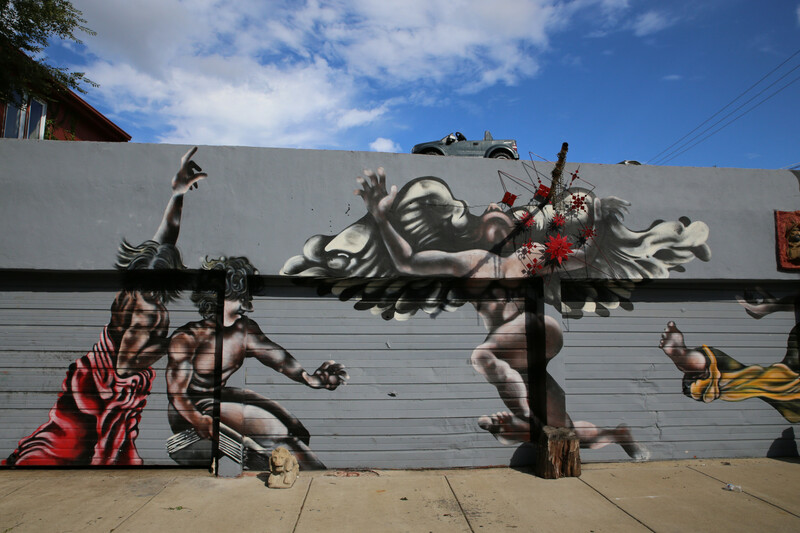 Pilsen was named one of Forbes’s coolest neighborhoods in the world because presumably it’s become this artistic and cultural hub, when the idea is that it’s been an artistic and cultural hub. Whether it’s like the murals on the walls, or the National Museum of Mexican Art, or the graffiti—all this stuff that we’ve done for years that’s been considered just those things that brown people in the hood are doing. Like the Dojo—which I think was a cool space—it opened in a way that was being considered the first DIY space in Pilsen. I was like, “Are you kidding me?” What about Southside Ignoramus Quartet? What about Decima Musa, you know what I mean? And all these other types of cultural spaces that existed that were essentially DIY spaces. But the stories that are there, and the history that is there—that’s actually what makes a community. So part of how [new] businesses factor into that is that they want to cash in on some notion of being a part of the urban edge and countercultural cool in a way that exacerbates gentrification. This triangulation of real estate and art-washing and city planning all of a sudden can swoop in and obliterate those people that have worked so hard to just stay alive here and to thrive here. When we hear about school closings that are happening in Chicago, we all know how much a school is a part of a community. People’s brothers and sisters went there, and they identify with the school. Businesses work the same way. Tino’s was my parents’ tailor, you know what I mean? I’m just thinking about my family friends that have had businesses up and down 18th Street. And then now all those histories are stuff for photo books, right? Like pictures that are stored in Payless shoe boxes. I think so much about Pablo Serrano, who is the founder of the People’s Stage Karaoke and a muralist. He’s used art to bring people together. The Karaoke goes up at Caminos De Michoacan and all of a sudden it’s packed, and this person that’s working at Target can get up there and sing and create in a way that makes me want to cry. I think that’s the stuff that we need to be celebrating—the ways in which we feel our own extraordinariness. And there’s different ways of feeling that. Like when you bust open a fire hydrant and everyone runs to it. And the way the park feels when summer finally hits and it’s just full with people. Despite all the best efforts of oppressive regimes and city governance, we have found these ways to be here together and persist in a way that is really beautiful and epic and heroic. It was a beautiful summer night in Pilsen and we had no plans. My partner asked, “Should we see what’s on at Harrison Park?” Usually we would head to the baseball diamond but that night it was empty. So we followed the cheers and the music to the floodlit soccer field where men in Tecate-sponsored jerseys were racing back and forth across the turf. 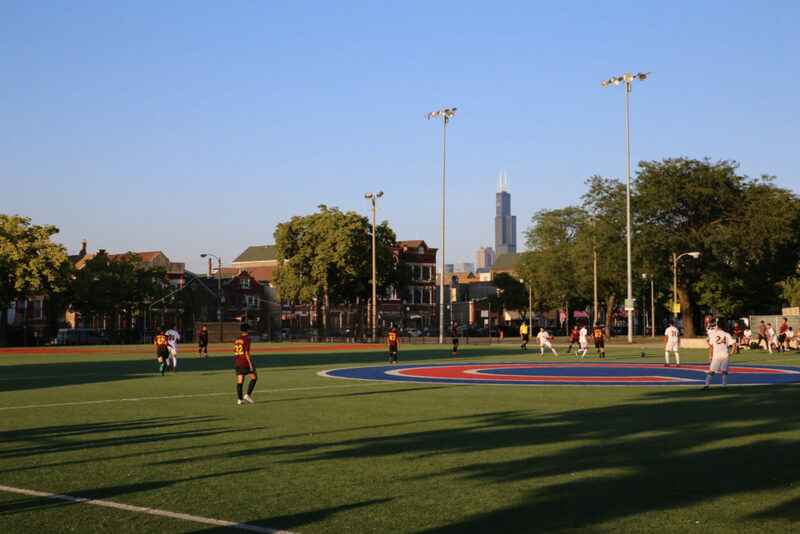 It was a championship game for one of the many rec leagues that play at Harrison park—from football to fútbol and my favorite: Chicago’s own 16-inch softball. That night, bleachers were full of families and raucous supporters. Two different groups had brought their own speakers (one was actually a karaoke machine) and they were blasting competing tunes across the field. Children with sticky hands entertained themselves in the stands. The paleta men rang their bells from the sidelines. We didn’t know who was playing. We didn’t know the score. But it didn’t matter. It was a perfect night out at the ball game. You can have an experience like this on any given day in Harrison Park—that is until the cold weather chases us all inside. On a sunny Sunday afternoon, you can skip the Sox game and instead watch some of the most competitive softball teams in the city—both men and women—as they exchange trash talk and make breathtaking plays without the benefit of a catcher’s mitt. The Sones De México Ensemble was founded at a party in Pilsen in 1994. Since then, the ensemble has released six albums of Mexican folk music, toured around the country, and received two Grammy nominations for their album Esta Tierra Es Tuya (This Land Is Your Land). Now they want to teach your kids to play guitar. When I attended the summer recital for the Sones De México Music School, I assumed it would be like the recitals of my youth: long, awkward, and full of flubs. That is not what transpired in the second floor classroom of St. Ann Church, where the school is based. Instead, the audience of parents, siblings, and abuelas was treated to a private concert with the ensemble’s co-founders. Of course, the ten students were there, too. They sat in a semicircle, each holding their own guitar. Off to one side stood the co-founders: Victor Pichardo on guitar and Juan Dies on bass ukulele (he took pains to clarify that this is not actually a Mexican instrument). Pichardo welcomed the audience in Spanish and helped each student tune their instrument. He counted off a time signature, and then he and Dies launched into song. The set list featured popular folk tunes like “Cielito Lindo” and “La Llorona,” and the families were happy to join in. The students strummed along in unison and—at their teacher’s urging—a few children sang under their breath. If some of the students struggled to keep time or make the chord changes, you could barely tell over Dies and Pichardo’s powerful voices and spirited playing. At first, I thought it was a little strange how the teachers stole the spotlight. But watching Pichardo’s animated lectures between songs, I realized that maybe the point wasn’t for each student to nail the chord changes. The point was to get parents and children in a room together to sing, learn, and share an oral tradition between them. The Sones De México Music School offers five levels of group guitar classes for kids ages nine to fourteen. Adult family members can also sign up to learn alongside their children. In fact, the school strongly encourages family registration: you’ll get an additional discount for every family member that registers as a group. All classes are taught in Spanish, and the school offers full and half scholarships for families in need. ‘L’ Cafecito Jumping Bean is an everyday kind of miracle. It occupies a small retail space inside the Damen Pink Line station—the kind of space usually reserved for chains like Dunkin’ Donuts. But Jumping Bean is not a chain. It’s a neighborhood institution, owned and operated by Pilsen local Eleazar Delgado. The original Cafe Jumping Bean on 18th Street has been around since 1994. 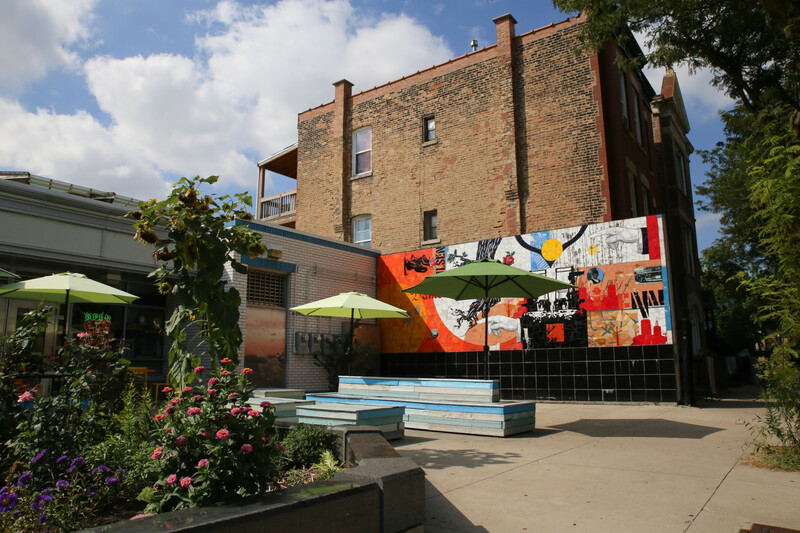 In 2016, Delgado expanded to the Damen location with an abridged version of the cafe’s menu. And this, too, is a miracle: no matter the occasion, there is something on this tiny menu that will meet your need. Craving Jewish comfort food? Get a lox bagel. Feeling sick? Have a cup of soup. Hot and sweaty from a festival in Harrison Park? Get a limonada. Need some liquid courage to face the cold and grey? Café con leche, regular, no sugar. I didn’t think I could love my Cafecito more, but then summer came and brought with it another every day miracle: the patio. Normally confined to just a few square feet, the cafe expanded outside into the plaza on the “L” station’s north side. Now, morning dog walkers can sit with their pups and linger over coffee at one of the faded blue benches. Locals can take their lunch break outside at the long common table. And the best part is, you don’t have to buy a thing. ‘L’ Cafecito Jumping Bean, 2010 S. Damen Ave. Monday—Friday, 6am—7pm. Saturday—Sunday, 7am—5pm. (312) 366-2930. In the airy, sun-filled recreation hall of Lincoln Church, bright graffiti writing declares the space to be the home of Healthy Hood, a fitness and dance studio that offers classes starting at just $5. Murals by local artists depict Malcolm X, Elaine Brown, Elvira Arellano, Oscar López Rivera, Rudy Lozano, and the church’s pastor Emma Lozano. Emma’s daughter Tanya Lozano founded the gym in 2014. Its mission: to address the twenty-year life expectancy gap between underserved communities and higher-income communities. Healthy Hood grew out of a recognition that the five most common diseases affecting the surrounding community were avoidable, said Lozano, and that with lifestyle changes, the twenty-year life expectancy gap could be reduced or even prevented. Lozano started the “5 + 1 = 20” campaign to help close the gap. With classes in yoga, cardio kickboxing, karate, and dance, Healthy Hood addresses health disparities by approaching fitness in a community-oriented model. “Instead of making it an individualized thing where people are working out to better themselves aesthetically, they’re working out to address this life expectancy gap,” said Lozano. She added that all the instructors at Healthy Hood are people of color from underserved communities. In addition to the classes offered at Healthy Hood, a garden in the churchyard produces fresh fruits and veggies that are freely available to the community. The gym’s garden club provides healthy recipes on its website and occasionally offers cooking classes. Xia Xiang took the six-week Bootcamp class taught by Seobia Rivers. “[Rivers] has great energy and knows what she’s talking about,” said Xiang. “Not only did she train us physically, but also created an entire booklet with recipes full of food we should eat and how to incorporate them into our diet.” The class also had a Facebook group for the students, and Rivers did individual check-ins with them every two weeks. If you’ve ever passed the corner of 18th and Leavitt Streets, you’ve seen Angel’s Tire Shop. Like something out of a Studio Ghibli movie, the shop sits colorfully on the corner, with its collection of art and knick-knacks spilling out from the storefront. 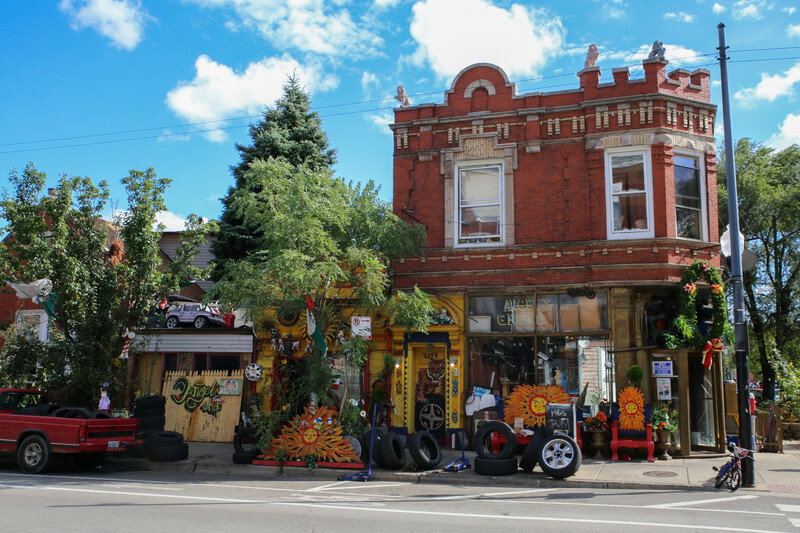 The noise of the neighborhood seems to die down as you make your way down the sidewalk, which is piled high with any number of doodads, lawn gnomes, vintage metal tools and other artifacts. Light catches on CDs as they hang from the trees outside of the shop, and on nice days you’ll find a chicken pecking away at a corn cob from underneath a wheelchair. Just like a normal art gallery, the tire shop is always rotating its collection. But there are also mainstays, like a dilapidated yellow Volkswagen Beetle. 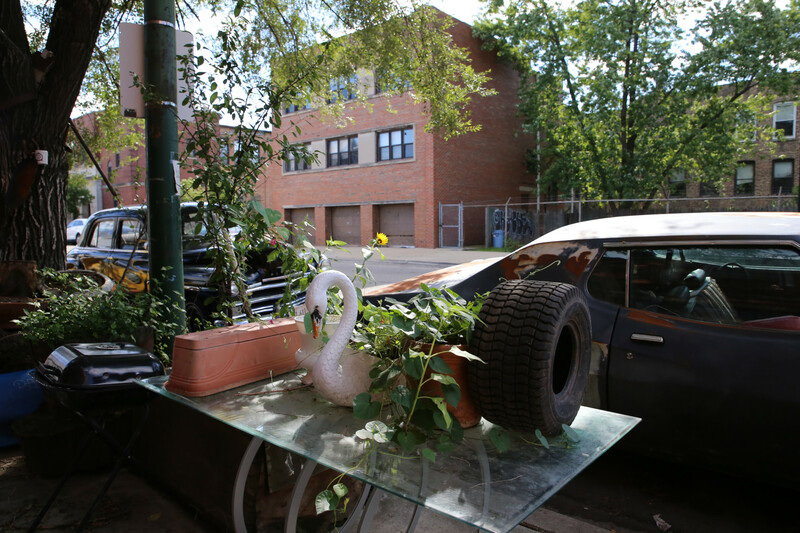 All of these art objects were found and collected by the shop’s owner Angel Delgado. Delgado, who identifies as an art appreciator, pointed out specific pieces, such as a large, weather beaten painting of Mexican revolutionary Pancho Villa. He’s also an artist himself. Among the flower pots, used bicycles, and cement mixers, Delgado has added to the mix by painting some of the murals on the shop’s exterior. 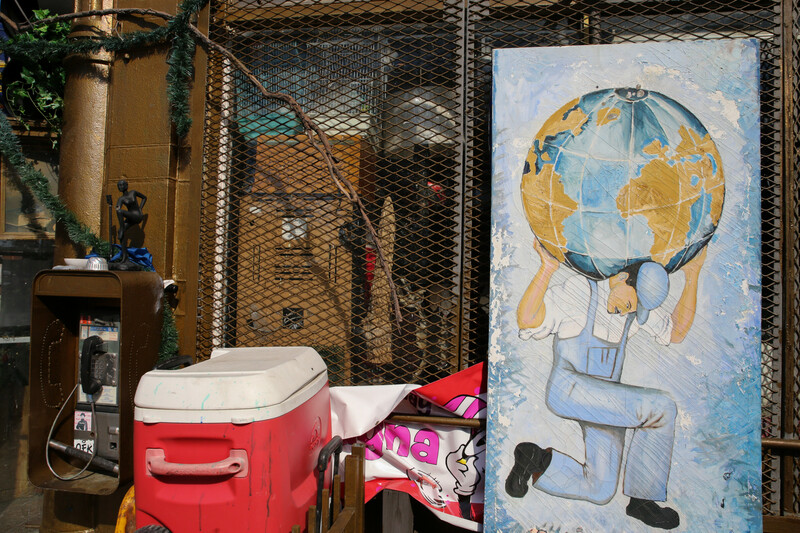 “To some people, it’s all junk, but to me it’s art,” Delgado said as he pointed out the bright yellow “Angel’s Tire Shop” sign that sits above a string of piñatas. If you share Delgado’s admiration for this art collection, you’re in luck: all the items are for sale. Angel’s Tire Shop, 2157 W. 18th St. Monday–Sunday, 7am–7pm. In an emergency call (312) 316-8542.